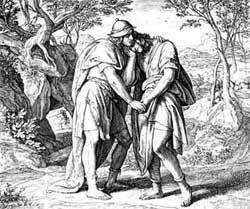 David and Jonathan were the best of friends. OW SAUL HAD a son, Jonathan, near David's own age. He and David became fast friends and loved one another as brothers. Saul the king became very jealous of David because the people praised him after his fight with Goliath. He even threatened to take David's life. He tried to catch him in his own house, but David's wife let him down from a window by a rope and he escaped. He met his friend Jonathan, who told him that he should flee. They renewed their promises of friendship, which they kept ever afterward. From his meeting with Jonathan, David went forth to be a wanderer, having no home as long as Saul lived. He found a great cave, called the cave of Adullam, and hid in it. Soon people heard where he was, and from all parts of the land, especially from his own tribe of Judah, men who were not satisfied with the rule of King Saul gathered around David. Saul soon heard that David, with a band of men, was hiding among the mountains of Judah, and that among those who aided him were certain priests. This enraged King Saul, and he ordered his guards to kill all the priests. The guards would not obey him, for they felt that it was a wicked thing to lay hands upon the priests of the Lord. But he found one man whose name was Doeg, an Edomite, who was willing to obey the king. And Doeg, the Edomite, killed eighty-five men who wore the priestly garments. All through the land went the news of Saul's dreadful deed, and everywhere the people began to turn from Saul, and to look toward David as the only hope of the nation. When Saul died he was followed by David, the shepherd boy, now grown to manhood and greatly loved by the people. He had many battles to fight with the Philistines and was nearly always victorious. He was a warrior king; but he was more than a warrior. He played on his harp and composed many beautiful hymns and songs, which are collected in the book of Psalms. He was a good king and tried to obey God's command. He had a long reign and his people were happy and prosperous. He had many sons and daughters and beautiful palaces for them to live in.